The invitation sketched by Karl Lagerfeld reads, “Coco Chanel back in Dallas”. The fashion show for the 2013/14 Métiers d’Art collection titled “Paris-Dallas” will take place on the 10th of December 2013 at Dallas Fair Park, a historical venue with art-deco architecture that is located in the heart of the Texan city. This event is the occasion to celebrate the strong bond that linked the French designer to the United States. “I admire and love America. It’s where I made my fortune. For many Americans (…), I am France” stated Gabrielle Chanel, cited by Paul Morand in his book, The Allure of Chanel. The climax of this mutual passion dates back to 1957, when Coco Chanel – accompanied by a delegation of 125 people from France – landed on October 14th at the Dallas airport. Stanley Marcus, co-founder of the Neiman Marcus store, awarded her with the Neiman Marcus Award for Distinguished Service in the Field of Fashion, the “Oscar of Fashion”. That year, the designer of rue Cambon is the only winner among the 300 fashion designers invited, an indication of the importance she holds in the hearts of Americans. During her twelve-day Texan journey, Gabrielle Chanel dazzles the crowd to the point that Time Magazine reports the event by titling it “Dallas in Wonderland”. Fifty-six years later, Karl Lagerfeld returns to Dallas and retraces this journey that sealed the French-American love story of the designer with the people seduced by the modernity of her creations. 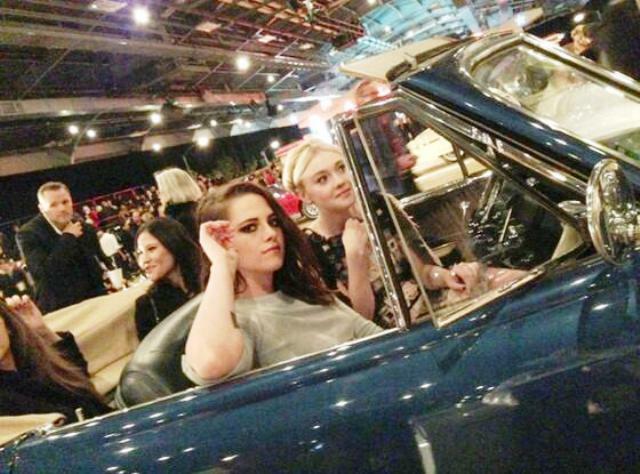 Chanel held its Western-themed Métiers d’Art show in Dallas last night, and following the spectacular, the house announced that Kristen Stewart (who flew to Texas to watch the runway romp) will star in the house’s Pre-Fall campaign. 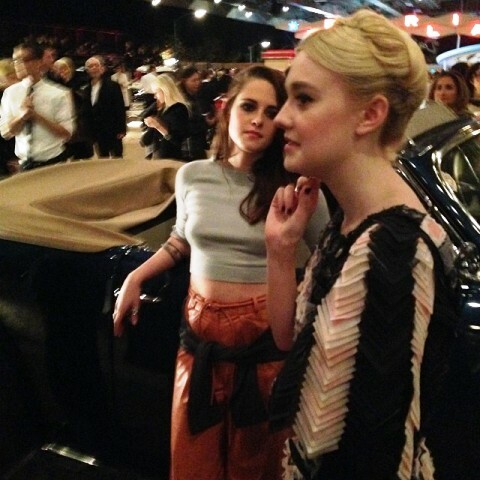 Kristen was in attendance along with Twilight costar Dakota Fanning. Nice to see the girls out and about.